WARP (the Wetland Archaeology Research Project) is an informal world-wide network of archaeologists and others engaged in wetland archaeology. Twenty five years ago we set up WARP to encourage contact and the exchange of information and ideas around the world. This led to the appearance of the newsletter NewsWARP, conferences and publications and, from 2000, the newsletter was replaced by the Journal of Wetland Archaeology. 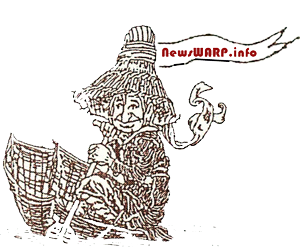 Now, thanks to WARP’s Pacific Co-ordinators Dale Croes and Akira Matsui, together with European Co-ordinators Francesco Menotti and Aidan O’Sullivan, we welcome the return of NewsWARP – on the web. Have a look for yourselves at http://newswarp.info/ and send in your news, comments, photos, questions, book announcements, etc in pdf format to Dale Croes at dcroes444@gmail.com – the more you contribute, the better NewsWARP will be. Please send a brief summary in English for contributions in other languages. We look forward to reading all your wetland news. We are pleased to announce a new communication service that we have been developing in response to a request by John and Bryony Coles, founders of WARP international network for researchers in wetland archaeology. As an offshoot of the former paper copy NewsWARP which alerted everyone to current announcements and wetland research, Akira Matsui and Dale Croes, WARP Pacific representatives, Francesco Menotti and Aidan O’Sullivan, WARP European representative, have initiated a web site to continue these basic communications across the world, but in a digital format. Our new web site address is: http://NewsWARP.info –be sure to bookmark this site. We require finished PDF copies of announcements and reports and that they be sent to Dale Croes at dcroes444@gmail.com and he will coordinate their postings with Akira Matsui, Francesco Menotti, and Aidan O’Sullivan. Thank you for supporting this communication service developed through WARP.